Hi Frank. My sympathies to your wife. (And to you.) This was originally written in response to a guy who was upset because I had been photographed holding a cup of coffee from Starbucks. I’m sure it made him feel better. I hope the same for your wife. In my ongoing quest to maintain the illusion of fitness, I got up once again this morning and jogged across the Golden Gate Bridge. Fueled by a Venti Latte and a double shot of espresso, I left the local Starbucks with my usual levels of energy and optimism, eager to meet the new day and shed a few pounds. It was a perfect morning. The sun crept over the San Francisco skyline, lighting up the bridge in that specific shade of orange unique to The Golden Gate. Five hundred feet below, the bay shimmered in hues of silver and blue, and the Marin Headlands twinkled in the distance like a pile of massive emeralds. An off-shore breeze cooled the sweat on my face, and all was right with the world. However, as I reached the Sausalito side and turned back for home, something went horribly wrong. Technically, I guess it was a cramp, but it felt more like an ice pick tearing into what personal trainers now call the “core.” This wasn’t a “runners stitch” brought about a lack of oxygen. This was something else altogether – a stabbing sensation that literally knocked the wind out of me before vanishing as quickly as it appeared. Stunned by the sudden pain and gasping for breath, I began to consider the wisdom of that extra espresso when another cramp flew into my guts on the tip of a spear, this one somewhere below my belly button and even more painful than the first. Clearly, the Starbucks Venti Latte had made it to my colon, where it now conspired with last night’s prime rib and lobster mashed potatoes. Their plan – as best I could tell – seemed to involve an immediate and unscheduled departure from the nearest exit. Like Al Roker and millions of other mostly continent Americans, I am all too human. And yes, I too was once betrayed by that small yet critical muscle that preserves our dignity and separates us from the animals. In fact, some years ago I had a serious conversation with a publisher about compiling a collection of true stories from notable personalities who had managed to crap their pants in public. You’d be surprised how candid public figures can be if someone else breaks the ice. Anyway, the project was never flushed out, so to speak, but I imagine a catastrophic failure in the middle of The Golden Gate Bridge would be hard to top. Regardless, it was not an honor I aspired to. My situation was dire. I was about two and half miles from home, and began to calculate the time to my personal toilet if I maintained a steady speed of 7 mph: about 18 minutes. Not good. I figured I might have 10 minutes before the ultimate humiliation – maybe less, and concluded that the odds were very much against getting off the bridge unsullied. As if to confirm my fears, another spasm arrived, and this one brought tears to my eyes. Like labor pains, the interval between each successive cramp was becoming shorter and shorter. This was not the “call of nature.” This was more like a shriek. Obviously, standing still wasn’t going to fix the problem, and running would only worsen it. But as Churchill famously advised, “if you’re going through hell…keep going.” And so I went. That is to say, I ran. Like Forrest Gump I ran for my life. Every step was a new dimension in pain, but I kept my head down and put one foot in front of the other. And as long as my head was bowed, I prayed. I prayed for mercy. I prayed for control. I prayed for divine intervention. The math was now decidedly against me, and I knew with every step the mutiny in my bowels would rule the day. And then, a miracle. Like an oasis in the heart of the Gobi, salvation materialized in the streets of San Francisco, and my prayers were answered. Pictured above is me, a Porta-Potty, and two guys from Vulcan Construction, who happened to be working about a mile from my apartment. (Swear to God – a sewer main.) That’s Larry on the left. He sent me this photo after taking it with my sincere thanks. I didn’t get the other guy’s name, but I’m indebted to them both. 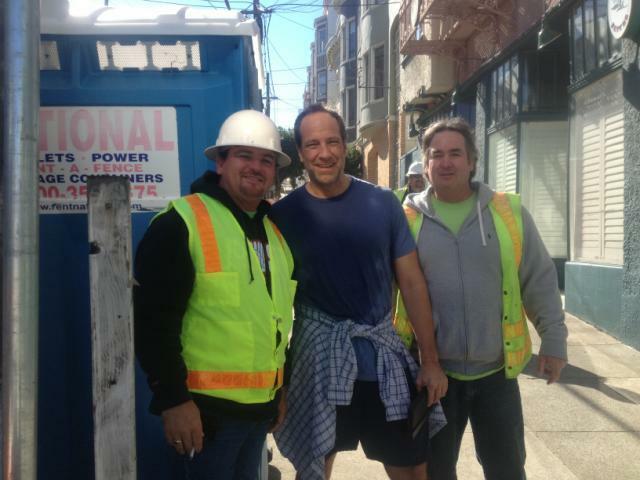 As you may know, Porta-Potties on construction sites are not a public service, and most of the ones in San Francisco are locked up when not in use. Thankfully – for both me and the community at large – the men at Vulcan are not proprietary with their Porta-Potty. They allowed me quick access, and asked only for a simple photo in return. I would have given so much more. I’ll spare you the details of what happened inside. Suffice it to say I made it to a seated posture with maybe half a second to spare, and unleashed what Larry called “a real and lasting homage to Bastille Day.” (Construction workers are funnier than you think.) Likewise, the particulars of my final sprint across the Golden Gate are best left to the imagination. I can only tell you that many an early morning commuter caught a glimpse of the Dirty Jobs Guy in full flight, stopping every 50 feet to scream frantically at the heavens while making the only face one can possibly make when his entire purpose in life is to not disgrace himself on a national landmark. On the positive side, I don’t think I’ve ever lost more weight on a 5-mile run.